Throughout history people spend their lives dedicated to consumption. They consume to survive and to enjoy, planning consumption. They compare their consumption with that of other people, their neighbors, and various role models. A human can be likened to an amoeba which seeks out good things and then engulfs them. Conventional economic wisdom promotes more “consumption” as a panacea that will benefit us all. From ancient philosophy and modern science, this perspective is hideously incorrect. At this scale the carbon atom is scarce, 0.6 in solids including all biomass, and 0.9 in the air. Yet the hexagonal carbon atom is the key to life trading bonds with hydrogen for bonds with oxygen. Before the Industrial Revolution had set in to change the planet, and before Dalton discovered atoms (1802), the foundations of economics were in already place, analyzing the cycle between farm produce and cottage industry (Quesnay 1756) and the monetary exchange calculation of consumer items by primitive hunters (Smith 1776). The human perspective of consumers and planners, world leaders was governed by money values of price, income and GDP. 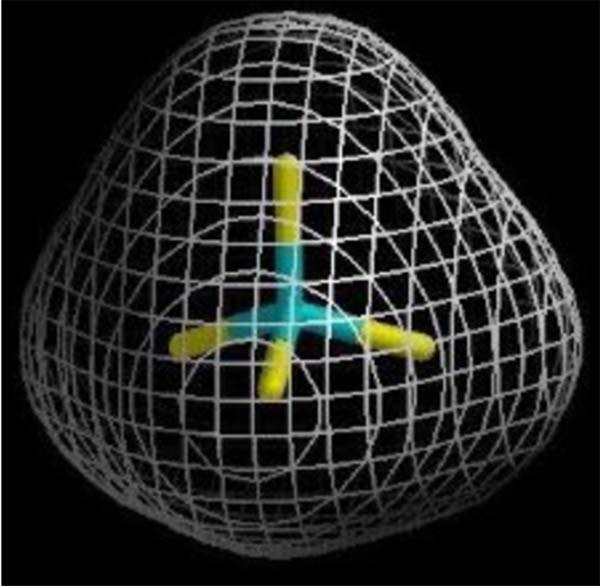 Objective observation and computation using recent advances in science can zoom from personal activities up to global conditions, and also down from eyeball senses to the interaction of atoms. What a person eats can be linked to global food demand and down to the chemistry of carbohydrates. From a global omniscient perspective, life appears as a quest to manipulate carbon-hydrogen bonds to break and for the carbon to attract oxygen from the air to form new bonds. The bond formed is double the strength of the carbon-hydrogen bond. Chemists have known this for decades and used it to label the “calories” of foods and also then same “energy available” in all fuels including the big 3 fossil fuels, coal, oil and natural gas. Simply, the carbon-hydrogen bond has a strength of about 4 electronvolts and that of carbon-oxygen is over 8 ev. When a kilogram the simple molecule CH4 (natural gas) reacts with O2 the difference in total bond strengths is 26 megajoules, the key fact that heats rooms, cooks food and drives machines. The 4 bonds of CH4 total 17 ev in a total molecule calculated at 122 ev. Combined with the oxygen the total is 471 ev. In reaction carbon dioxide and water are produced, also with same total envelope of 471 ev, but now the bonds are stronger (in the carbon dioxide) and the excess strength no longer needed is “available” for human use. In the new perspective using science to understand economic activity, the reason that locking carbon into a stronger bond (carbon dioxide) actually releases energy for use. Modern science in the past 2 decades has been able to reveal the topological nature of atoms in molecules (Bader 1991) and the bond strengths can be set against the context of the overall molecular electron charge density within the molecule’s shape. This benefit has been obvious (without being understood) as long as life existed and evolved into human consciousness as a love for food and all forms of energy, including draft animals, wood fires and eventually fossil fuels. Now concern with the global economy, the financial crises, debt so great as to be incomprehensible and at the same time the idea that human activity has impact on climate, it requires a fresh perspective. Economist, financial experts and world leaders transfixed with money measurement and remedies must be introduced to the reality that money no longer represents. Frustrated with the inability to link money uniformly to reality the respected journal The Economist, introduced “the Big Mac index” 巨无霸指数. To simplify, a bread bun index 馒头指数 of uniform carbohydrate content of 100 kilojoules can be viewed as a store of carbon-hydrogen bonds that are consumed by a worker and transformed into “work”. To assist economists understand, each carbon-hydrogen bond can be valued as two halves of 50 yuan, and bonded together constitute a value of 50 yuan. In the envelope of the carbohydrate molecule there is also “dangling loose” one half of a 100 yuan note. The same situation is in an oxygen molecule, bonded by halves of 50 yuan notes, but with a spare half of 100 yuan. 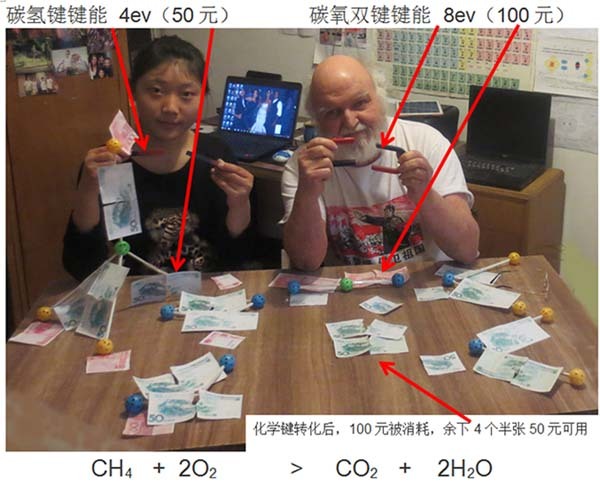 On collision the bonds break and a new molecule of carbon dioxide is formed with the halves of 100 yuan notes as bonds. But the envelope of total molecular charge is constant and the “energy not needed” is released. The dictionary defines “entropy” as “unavailable energy” and the molecular envelope in the products of the process, dominated by the tightly locked carbon dioxide bond is high entropy. An objective alien observer may well wonder why humans seem hellbent on a race to increase high entropy under the dome 穹顶之下. Our past lives have focused on the energy released that drives economic processes, from individual consumption of food up to the huge inputs of fossil fuels for industry. Now that drive can be envisaged in a universal currency of carbon-hydrogen bonds, metaphorically intended to “make” 200 yuan for life and a better life out of breaking bonds worth 50 yuan. We now must recognize this also as a race to stuff another 200 yuan into choking the air under the dome we live in. If a mantou costs 50 cents then the standard carbon-hydrogen bond is worth 6.64 x 10-24 fen (RMB). The C-H bonds traded in 2014 totaled 1,799 x 1037, and by this approach total human activity is “worth” (in “mantou reality bonds”) $20 trillion.The nominal global GDP last year according to conventional economic accounting was $80 trillion. The carbon-oxygen bonds produced by human effort was $40 trillion according to the mantou approach. 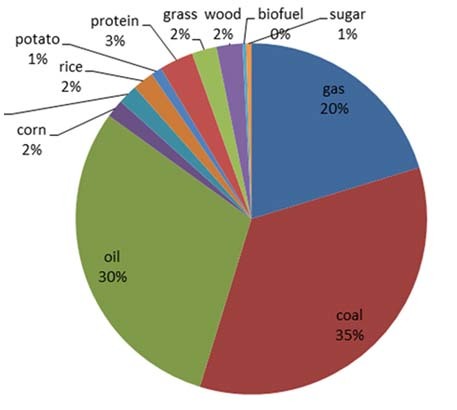 Number of carbon-hydogen bonds (x 1037) in the hydrocarbons and carbohydrates that were traded for carbon-oxygen bonds in 2014.